Vanilla Dome 2 is a level of Super Mario World. To get to this level, the players must clear the normal exit of Vanilla Dome 1. By completing this level through the Giant Gate, the players gain access to Vanilla Ghost House. By accessing the secret exit, the players gains access to Red Switch Palace. It is a mix of an underground and an underwater level. The level starts off with Mario falling down into a small bed of water. The player then encounters a Cheep Cheep that struggles to get inside the water. There is also a Buzzy Beetle there. The player must swim through water with a couple of Cheep Cheeps. The player then finds a block with a Vine inside of it. After, the player encounters some more Buzzy Beetles. Then, they see an arrow made out of some coins and a Dragon Coin. 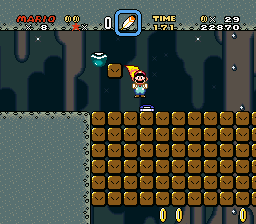 The player continues swimming, and finds a hidden block containing a 1-Up Mushroom, along with some coin blocks and a block with a power-up inside of it. More Cheep Cheeps are seen here. The player sees a lone ? Block with a power-up inside of it. The path breaks from here. The player can either go up and back to the route they started from, hit the P Switch, and fall through the used blocks that were once unaccessible. Here the player finds a Key, Keyhole, and some more Cheep Cheeps. If the player uses it, they gain access to the Red Switch Palace. The player can also take the route that requires swimming to the right, where they encounter some Chargin' Chucks. The player can also either go up and right, where they encounter Buzzy Beetles and Chargin' Chucks. The player can find a Roulette Block, along with the Midway Gate of the level. The player sees a hill that they can slide down, while collecting a Dragon Coin and some regular coins. The players have to press the P Switch to get past the used blocks. A Chargin' Chuck and another lone power-up block can be seen here, along with some Rotating Blocks. A pipe that the player can go through is right here, leading them into a slippery area that contains a Coin Block, which has 10 coins in it, Buzzy Beetles, and Cheep Cheeps. The player advances, and then finds another Chargin' Chuck with a Buzzy Beetle, along with a bunch of Swoopers. A Chargin' Chuck that can multiply into three Chucks can be seen here on a ledge. The Giant Gate can be seen here, allowing the player to access to Vanilla Ghost House.